Ms. Scott Barnier’s Grade 9 Music ISP is on the history of an instrument. Her class was given the option to create a video, where students would make a 5 - 7 minute video about the history of an instrument. 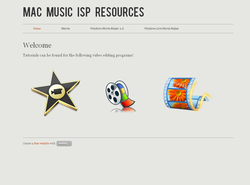 The requirements of the ISP are audio and video of the student, audio over a still image, and text over a still image or video. She requested us to teach her students how to use video editing software so they would be able to fulfill all the requirements without any trouble. As there are two types of computers, Macs and PCs, we chose to teach the class iMovie for Macs and Windows Movie Maker for PCs. These programs are free and easy to use. Sharice taught the class how to use iMovie and Denise taught the class how to use Windows Movie Maker. We decided to teach her students in class and go through the tutorials live so students would be able to voice comments and concerns with the programs. We also wanted her students to be able to do all the required fields of the ISP, so we created video tutorials for her class. We used Jing to record video tutorials. The website we used to display our tutorials is Weebly Education, because it is very user friendly, organized and has embedding options. Creating a movie is a new and original way to present any project, assignment, presentation or ISP. As this placement covered all the basic features of iMovie and Windows Movie Maker, students now have the ability to create videos. The possibilities are endless with video-based projects and understanding movie editing software opens up this new medium for students to explore. iMovie is a built-in movie editing software application on Mac computers which allows Mac users to easily create and edit videos. This software consists of a simple drag and drop type of editing, which makes creating videos a breeze. iMovie is already equipped with tons of sound effects, transitions, text animation, and themes. With the help of iMovie, students and teachers can make professional looking videos in no time. Windows Movie Maker is a a built-in movie editing software application which allows PC users to easily create and edit videos. This program uses an intuitive drag and drop system, allowing for simple editing. This earlier version was chosen over Windows Live Movie Maker because images, video clips and audio files can be organized by Collections, so there is less clutter. Windows Live Movie Maker does not have this option, so we opted for the earlier version of this software. On our resource site, we have in-depth Jing tutorials for Ms Scott's students to access. These tutorials include how to add video clips, photos, sound, transitions and text. The video tutorials only cover iMovie and Windows Movie Maker 2.6. We got Windows Live Movie Maker resources from Eric Truong and Vicky La, who taught Ms Gourley's class how to use Windows Live Movie Maker for their placement. This allowed the class to learn about WLMM on their own time if they chose to.